How complicated can a toaster be? You can get a cheap one for way under $10 that is little more than a hot wire. However, there are a few little complications. First, consumer products need to be safe — lawsuits are expensive. Second, there has to be some mechanism to hold the toast down until it is done. If you can buy one for $10 you can bet it isn’t some super toast processor running Linux in there. [Technology Connections] tore one down for you so you don’t have to. The circuitry is simple, and who knew there was a dedicated IC for toaster control? However, the real engineering is in the lowly little handle you pull down to start the toasting. That little bit of mechanics works as a power switch, a circuit breaker, and does the work that keeps the toast down until it is ready. The lever turns on the power which turns on an electromagnet. When the toaster decides it is done, it turns off the magnet which not only pops up the toast but also powers down the whole toaster. It is simple, but not too simple — as we always say, less isn’t really more; just enough is more. In all fairness, the IC inside is little more than an integrated 555 timer. The darkness control sets the frequency (nominally 1024 Hz) and the timer asserts the output until the timer expires. Of course, this is the cheapest possible toasters. Some toasters can be quite fancy with real time timers, temperature or color sensors, and some can even print the weather forecast on your toast. You can have a peek into a more sophisticated toaster oven in this NXP application note. 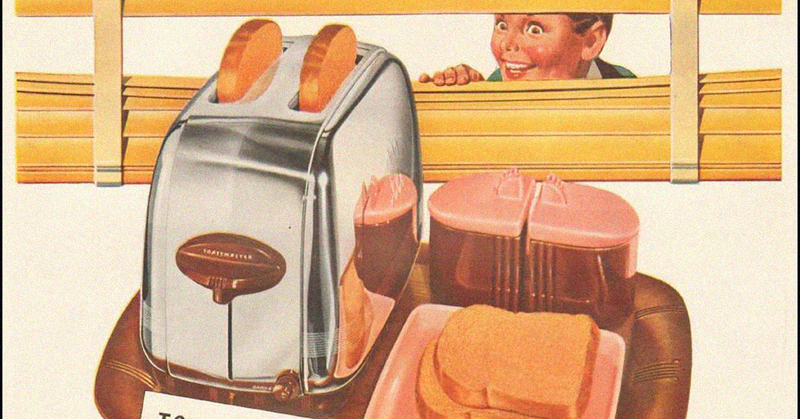 Toasters of the future may have their own neurosis. You could even have a flying toaster, but we don’t know why. With your own toaster, you never have to suffer from your breakfast failing to include toast — helpful if you are lack toast intolerant. We saw what you did there. I was strongly offended by the “lack toast intolerant” because I am the opposite – Glue tin intolerant. Well, I am Berry tolerant. No probs at all. Colin Furze also explains this a bit. Then makes it better. Not the first look at toasters either. These two videos were awful. Just mindless drivel made to generate clicks and ad revenue. Toasters can be quite complex to design properly. I remember a lecture on robust design engineering and an example of statistical Taguchi method being applied to a toaster to reveal the critical design variables and their best combination that would result in the most uniform toast that wasn’t sensitive to manufacturing variabilities. Couldn’t find that particular case, but this seemed interesting as well and goes to the earlier phases in product development and defining product architecture. Once toasters go IoT, they can be used to sneak secrets out of the company in the lunch pail. I think carrying a lunch pail at all would be a big red flag. It sounds like an upscale toaster The last cheepie I took apart for the nichrome wire was all mechanical as far is it’s mechanism went. No IC’s and no electromagnets. Just a simple bimetallic thermostat type device that released a catch so springs could pop the toast up and cut the power to the heater. This new toaster seems like it is putting a lot of electronics where it is not needed and there is more to go catastrophically wrong. It’ll be a shame when an EMP comes for our toaster. Hey you can make a toaster with no electronics at all (well it needs electricity of course) but today electronics are so cheap they just throw them at any problem. No, it doesn’t need electricity either (though heat from some source is nice). I was thinking to note the same thermomechanical and thermoelectric components from older toasters since they can be salvaged and re-purposed into other projects designs. Interesting seeing the integration of components into a toaster… that can be hacked easier maybe? Wondering what the RINT (like RF/EM) profile is like? So, they had the window open, but the Venetian blinds pulled down? And what is that next to it? Spam? not spam, they look to be lidded jars, salt and pepper perhaps. but the window thing is trippy. Window open for ventilation, blinds down to keep heat/sun out. You can easily spend $300 on a toaster now. I see Wolf brand on Amazon (US) for that much. Wolf is the label for high-end kitchen appliances that heat (better known for pro-sumer ranges), you might be more familiar with the manufacturer’s label for cold appliances: Sub-Zero. If your toaster can’t take out at least a full city block, you’re not ambitious enough. I used to design electric grills, both electrmechanical and all digital. The cost difference between the 2 is a lot smaller than most people would guess. It all comes down to the fact that electromechanical systems require more physical material, tighter (not a lot, but every penny counts) manufacturing tolerances, and more man hours than electronic controls. The digital controls typically require more R&D cost, but the ICs are so damn cheap, and the PCBA mfg is highly automated such that it offsets the cost of using digital circuitry. Also, the cost of line setup is getting cheaper for the digital controllers because the factory line can be switched to a new product with fewer tooling changes and lower down time. Everyone should read “The Toaster Project”, by Thomas Thwaites. One toaster I took apart used a CD4060 where its oscillator speed was set by the potentiometer that is the “doneness” level. My toaster drives me crazy. It beeps *before* it pops up. Probably, popping up opens the circuit so there’s no power flowing at all. Thus, it it’s going to beep, it has to beep before it’s done. It bugs me because it’s not the way I would’ve designed it. Why do toasters need to beep anyway? The pop-up sound is classic and unmistakable. The beep just sounds like everything else in the house that beeps. Yea a simple beep is kinda lame. My design would involve an eink screen on the side to display a small Link with arms stretched above his head, and a wav sound IC to play the classic zelda ‘item get’ sound. If it is going to add everything to make a beep yet doesn’t go this far, it’s just halfassing it in my book. Eink? No, if you’re going to go that far, you should spring for full color OLED. You could even show different generations of Link for the toast setting. The eInk makes sense since the toaster turns off when it pops up. Just a little issue that can be easily solved by adding more technology! No, posting a picture of your toast to Facebook? It’s anti-startle beep. You know, I’ve been startled many times by my toaster and that beep would actually help, especially when still being sleepy and starting morning toasts, then going to make morning coffee. Hope you don’t think it was alarm to hit the snooze by pushing down the lever again. And now someone’s going to make a toaster clock* with snooze. I’m imagining an anticlimactic scene in Pulp Fiction. I had to repair my microwave with with a plier to rip out it’s buzzer. The bloody thing kept beeping every 30 seconds after it was finished. One baked a cake in it and went shopping. Wen I came home a few hours later the thing was still beeping. My microwave won’t ever beep a nobody again nomore. OMG, your popcorn is done. YOUR POPCORN IS DONE! It’s done! Come get your popcorn! Your popcorn is ready! Come get your popcorn! It’s done! Your popcorn is getting cold! Delicious popcorn, ready to eat! Popcorn! Get your popcorn, here! Is anyone out there? What, do you hate popcorn? Popcorn, get it while it’s hot! I like my old late 60’s or early 70’s pop up toaster oven. Has a vertical slide on the right for toast color, a vertical slide on the left for oven temperature. There’s a small “Color Tuner” vertical slide on the right rear. There’s one slot on top for two slices of bread side by side. The bar to push down to activate toasting is on the right side. The door in front has a glass window, tips down and partially slides out a wire rack. Heating is via four horizontal quartz tubes with coiled (tungsten?) elements inside. Operation is entirely electro-mechanical. I assume there’s a bi-metallic device that trips a catch to release the bread basket and cut off the power. Attempting to toast again too soon results in a faster release and less toasty toast. For oven use, temperature is controlled by some thermostatic switch that pulses the heater rods on and off, with much heat flowing out the open top slot. Despite that it does a good job baking biscuits. A few years ago it would no longer latch down to toast, it’d just make a loud buzzing sound. Apparently near 40 years of almost daily use had caught up with it. So I took it apart. Seeing nothing obviously bent or broken, I put the dismantled device (aside from the heater rods, I didn’t want water in them) in my dishwasher and ran it through a cycle, without the heated dry. After letting it open air dry for a day I put it back together and it worked perfectly! I think there may have been some silicone grease on some of the sliding parts to dampen the motion because since getting its bath it sometimes ejects the toast completely, where it flaps down flat atop the toaster. Good for another 40 or more years! Nobody builds small kitchen appliances like that anymore. Flying toasters….. Gawd, I miss After Dark. I think that was the first app that I ever paid for. I had After Dark on an old Mac IIfx it had the flying toasters, ,one called rat race with uncanny looking rats, and a hilarious one called bad dog. Linux? Of course not. Toasters are for NetBSD. 2019 and still no roast shade controlled toaster: when unfreezing slices of bread, I still have to figure out the correct toasting time. BTW, also waiting for the smoke detection integrated! Simple (temperature shielded, somehow) color sensor and you’re in business! Maybe a mirror? And some reliable illumination? Can you get away with just sensing the amount of reflected red? There is science to be done here! First person to implement this gets a Hackaday article, and Internet Fame. 2 – 255 … 254 different densities of charcoal. Sometimes $10 won’t cut it. It does not ‘pop’ it =glides=. Oooo! like the ‘expensive” cassette doors on boomboxes back in the 1970’s! Forgot to mention where yellow wire comes from . It normally comes from a tapping on one of the heating elements so the element is a big voltage divider . common fault as when connection point fails after a crumb has lodged there , no power to board.